Although not strictly within the West Ealing area, the company would have employed many previous residents in their works by the Iron Bridge at Southall. This year AEC, if it still existed, would have celebrated its centenary as it was established as a separate entity by the London General Omnibus Co Ltd back in 1912. Previously, from 1908, the bus company had built the chassis of its own buses rather than importing them from overseas. Their factory was at Walthamstow in north east London and this became too cramped, with work starting on creating a new factory complex on a virgin site on the Hanwell/Southall borders in March 1926. The first chassis being completed in the new works in February 1927. The company continued to enjoy a close relationship with the London General Omnibus Company providing it with the majority of its buses. This relationship was to endure through to London Transport’s creation in 1933 and beyond and its publicity material claimed “Builders of London’s buses”. The majority of London’s buses through to1970’s were made by AEC. Before privatisation in the 1980’s London Transport was the largest bus operator in the world having a fleet of 7,000 vehicles. 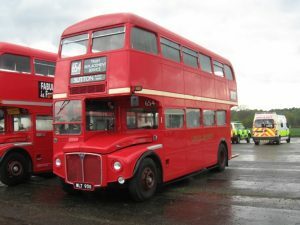 AEC named their bus and coach range with names beginning with “R”; Regal, Regent, Reliance, Renown with their most famous model the Routemaster. In addition to building bus and coach chassis they built commercial vehicles with evocative names such as Matador, Mammoth Major, Monarch, Majestic and Mercury. The Routemaster was the last vehicle designed specifically for the arduous traffic conditions in London and AEC worked on this project in conjunction with London Transport’s own engineers. The design dates from the 1950’s and the prototype entered service in 1956, with the squadron release of the type into service beginning in 1959 and not being completed until 1968. These were some of the last open platforms buses to be delivered and are still the only open platform buses in regular service (on Heritage Routes 9 &15) in London. That is ignoring the very brand new Routemaster prototypes introduced by the Mayor of London. By modern standards the old Routemasters weigh in at 7.5 tons against a modern double decker bus which is nearly 12 tons. This difference in weight can be explained by the vehicles not having a separate chassis and having a body built of aluminium. Of the original 2,900 built nearly 700 survive in the UK with an estimated 600 overseas. Whilst many are owned by preservationists some are used by private hire companies and tour operators, others have been converted into other usages like hospitality vehicles, mobile homes, cafes and restaurants. Whilst the Routemasters continue to survive, sadly AEC does not. After some rationalisation in the bus and truck industry after the war when AEC acquired Crossley Motors and Maudslay Motor Co., AEC itself was taken over by Leyland Motors in 1962. When Leyland got into financial difficulties in 1974 it was nationalised and the slow decline of the Southall site continued until it was closed on May 25th 1979. The extensive buildings on the site were demolished in 1981 and the Great Western Industrial Park was built on the land which also had included a sports club with playing fields. Whilst the name reflected the adjacent mainline railway and the road names some of its mechanical engineers it is a great shame there is no connection on site with its past use.